WFFH/WFFI/WBOZ/Nashville (94 FM the FISH) listeners took on the 18,000 Meal Challenge to provide 18,000 meals for the homeless in only 17 hours. 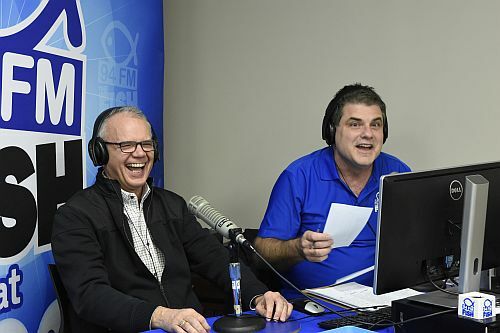 Fish hosts, Caryn Cruise and Doug Griffin set up a remote studio at the mission facility and broadcast from the call center in downtown Nashville. At the end of the 17 hours, the 18,000 meal goal was exceeded and over 25,000 meals and nights of shelter were provided. It was a new record for the event at a critical time of the year for the homeless. Pictured L-R Nashville Rescue Mission, CEO, Glenn Cranfield with Fish Afternoon Host, Doug Griffin.